Our workshop participants gain strong foundations enabling them to create authentic Thai classic recipes; or use their own culinary creativity to modify, adjust and elevate, both ancient and modern, Thai dishes within a context that makes sense stylistically and taste-wise. 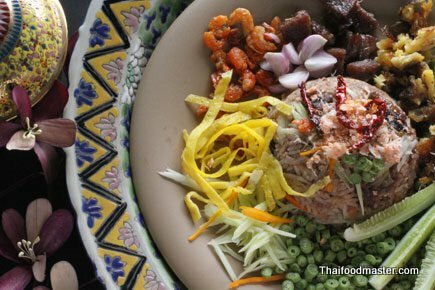 You might be surprised to learn that – despite Thailand’s diverse, abundant produce – the basic pillars of Thai cuisine are quite simple: rice, salt, chili, and some proteins from freshwater fish. 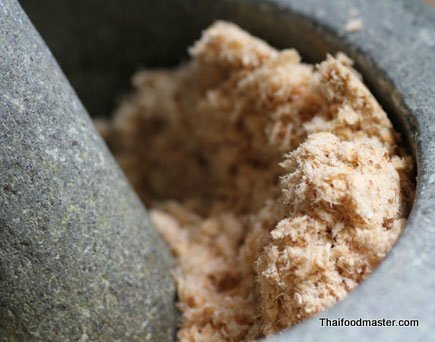 In the central and southern regions of the Kingdom, fermented shrimp paste (gabpi), which was originally devised as a preservative, is a fundamental base of Thai cuisine; in earlier days, rice and gabpi were essential elements in every traveler’s personal kit. 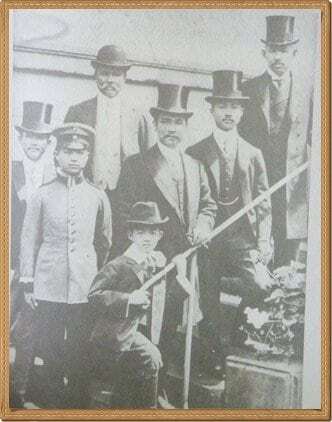 And so it happened that one night, during his second trip to Europe in 1907 and on his way back from Italy, King Rama V, Chulalongkorn the Great dreamed that his royal grandmother had prepared for him a very delicious plate of khaao khlook gabpi. 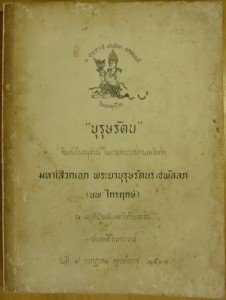 Maha Sawek Ek Phrayaa Boorootrat Rachaphanlohp (มหาเสวกเอก พระยาบุรุษรัตนราชพัลลภ), a senior official and the King’s close aide at the time, recounts the King’s dream in his memoirs “Booroot Rat (บุรุษรัตน)”. The dream was so vivid, Booroorat notes, that the somewhat homesick King requested a plate of khaao khlook gabpi, which the aide dutifully prepared. 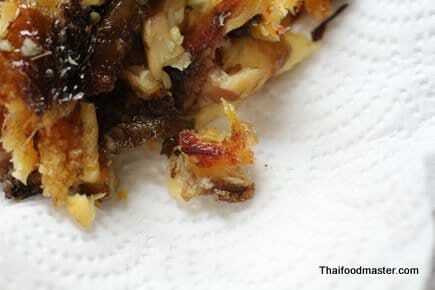 Eaten by poor and rich alike, khaao khlook gabpi is made from the very basic building blocks of Thai cuisine. 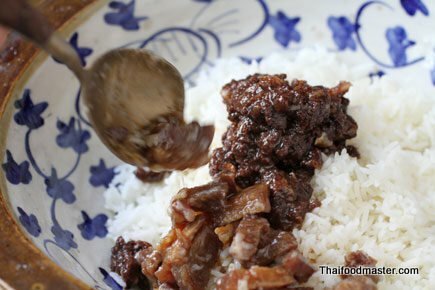 For Thais, is a glue between the generations; a dish that might make one feel closer to parents and grandparents. Khaao khlook gabpi brings you back home. 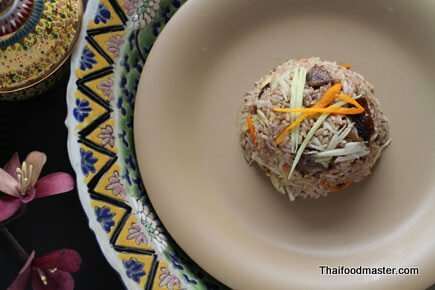 In keeping with its status as a primary dish in Thai cuisine, khaao khlook gabpi is simply prepared with a sophisticated finish and wonderful presentation. Each of the dish’s components is separately prepared and set aside, and mixed individually for each serving. A pleasant harmony of several flavors is created – complex and profound in taste, the dish is a stunning display of confidence. 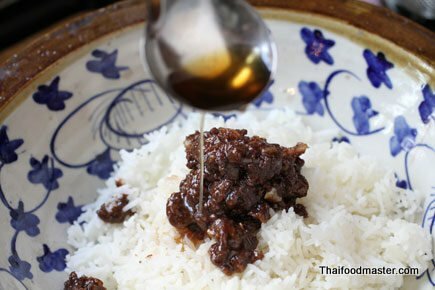 Fragrant jasmine rice is an excellent platform for the saltiness of the fermented shrimp paste, the sourness of the green mango (or ‘madan‘, guttiferae), which are blended further with the sweetness from sweet pork and the richness of the grilled and deep-fried catfish. There are many variations of this dish: I have chosen to publish the version described by Prince Johngjit thanaawm Disagoon. This is the very same version prepared for King Chulalongkorn the Great during his unforgettable trip to Italy. I would like to dedicate this dish to my friend, the late Johan Helin (1970-1994), who passed away in Thailand under tragic circumstances. Johan loved this dish so much. Each of the dish’s components is separately prepared and set aside, and mixed individually for each serving. A pleasant harmony of several flavors is created – complex and profound in taste, the dish is a stunning display of confidence. 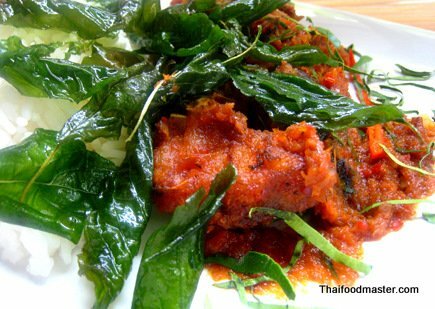 There are many variations of this dish: I have chosen to publish the version described by Prince Johngjit thanaawm Disagoon. This is the very same version prepared for King Chulalongkorn the Great during his unforgettable trip to Italy. 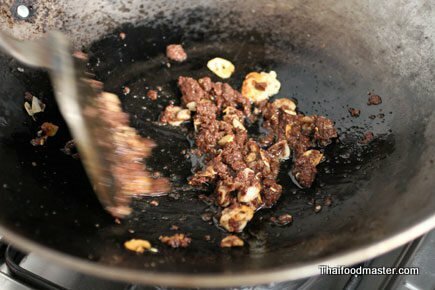 Begin by preparing the shrimp paste. 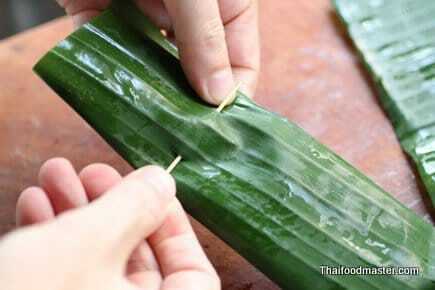 Roasting the paste wrapped with banana leaf serves two important purposes. First, this preparation method makes the paste fragrant, reducing the foul odor. Second, and perhaps more important, is that roasting the paste eliminates any parasites that might be lurking in it, making it safe to eat. 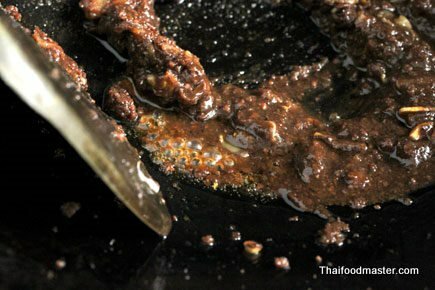 If you do not have access to banana leaves and/or a charcoal grill, use aluminum foil and roast on a hot pan. 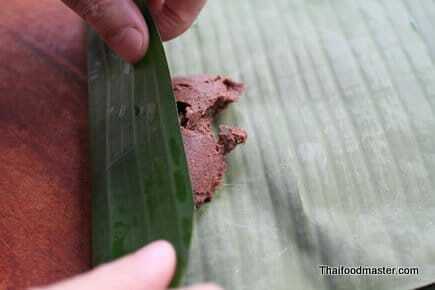 Wrap the shrimp paste with the banana leaf. Secure both ends with wooden toothpicks. 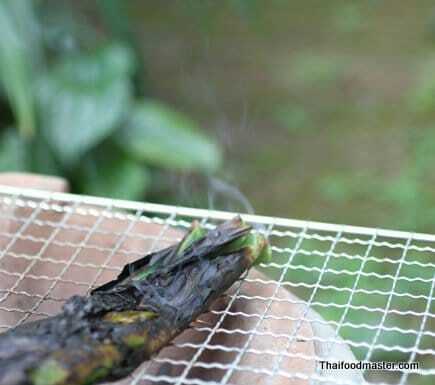 Roast the wrapped shrimp paste over a charcoal grill on low heat until fragrant. 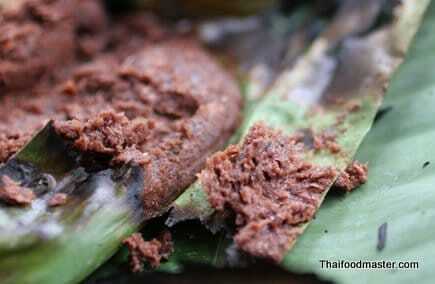 Remove the shrimp paste from the banana leaf; set aside. 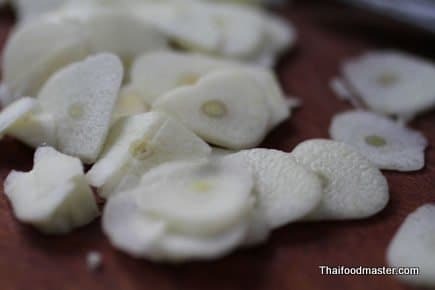 Cut the garlic into very thin slices. Fry the garlic in 2-3 tablespoons of a neutral-tasting oil until slightly golden. Add the roasted shrimp paste. 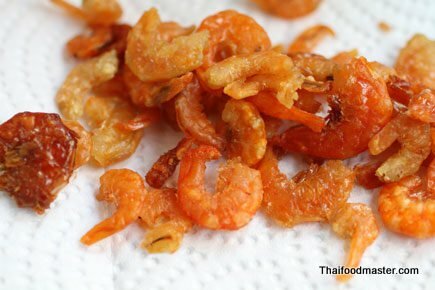 Fry the roasted shrimp paste with the garlic oil until fragrant. Add the sauce of sweet pork. 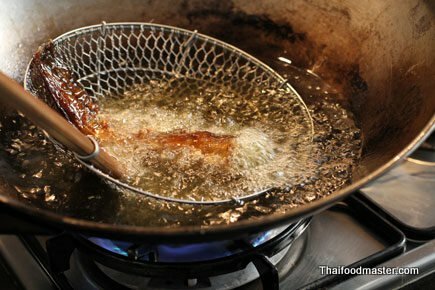 Continue frying until the paste becomes smooth; set aside. Fry the whole grilled catfish in oil over medium heat until the skin is crispy. 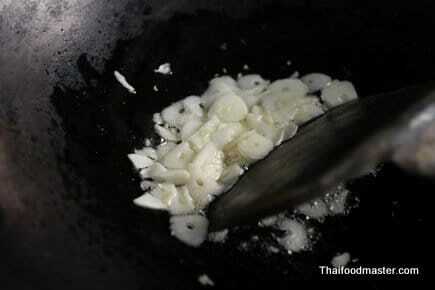 Drain any excess oil and, with your fingers, break the fish meat into small chunks. Set aside. Oil a non-stick pan, and spread the egg mix thin and wide. Cook on medium heat until the surface is almost done. 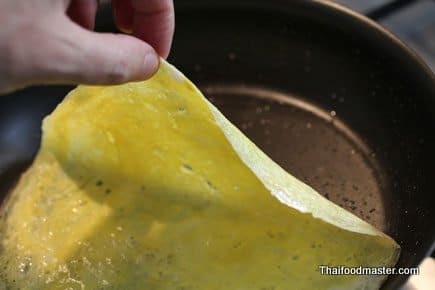 Roll and slice the crepe-like egg into thin shreds; set aside. While holding the mango in your left hand, tap it with a sharp knife, creating multiple scores. 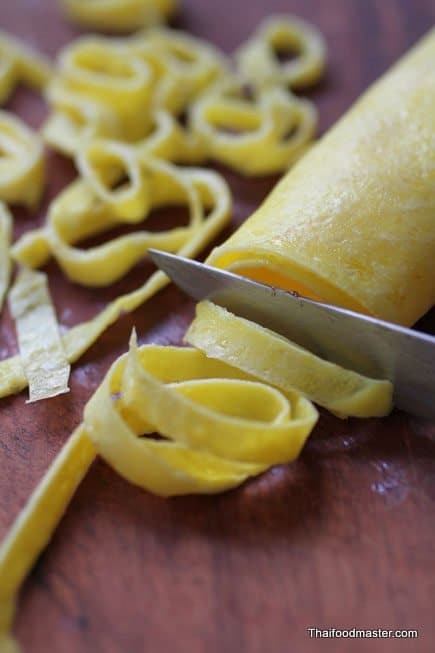 Using your knife, peel the scored mango, releasing julienne-like threads of the fruit. Set aside. Fry half of the dry shrimps until somewhat transparent; set aside. 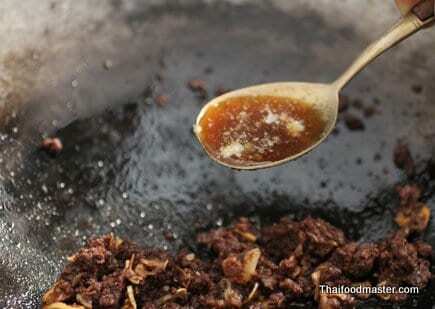 With a pestle and mortar, finely pound the remaining dry shrimps; set aside. 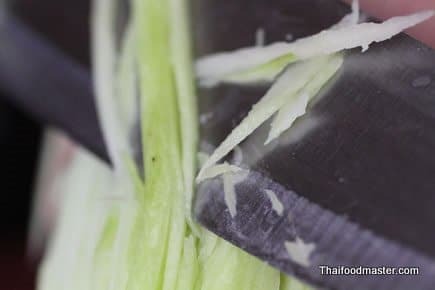 Cut the shallots into very thin slices; julienne the yellow chilis and fry them until they are bright in color. Set aside. 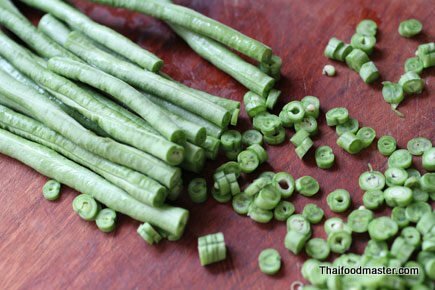 Cut the long beans into very thin slices; set aside. 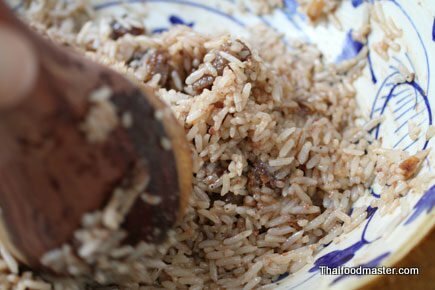 Place the cooked rice and the cooked shrimp paste into a mixing dish. Add 4-5 tablespoons of sweet pork. Mix everything well, adjusting the sweetness to taste. It should be salty-sweet at this stage. 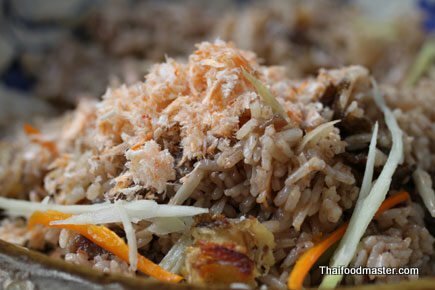 Add to the rice half the allotted amount of the fried catfish meat, the julienned green mango and the yellow chilies. Mix well and taste again. Adjust the flavor by adding green mango to increase sourness, chili for heat, or catfish meat for richness. Add half the amount of the pounded dry shrimps; mix again. Arrange the rice mix in the center of the plate using a mold. Place the side servings around the rice. These include the egg threads, the long beans, green mango, fried dry shrimps, shallots, and the remaining sweet pork and catfish meat. Dust the dish with what remains of the dry shrimp, and garnish with fried dry chilies. Curry shops are for the busy businessman and the hungry traveler a real must. They offer a selection of the most attractive and appetizing food you can think of. 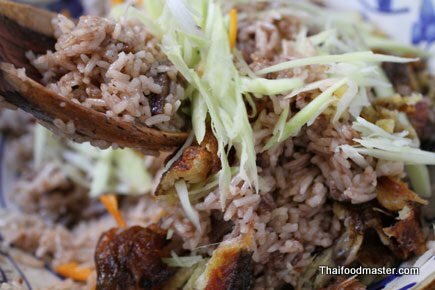 This is the Thai version of fast food, even faster than in the west. So here is a wonderful little lunchtime dish that goes well with yet another bowl of steamy hot rice, that comes of directly from the curry shops common repertoire. 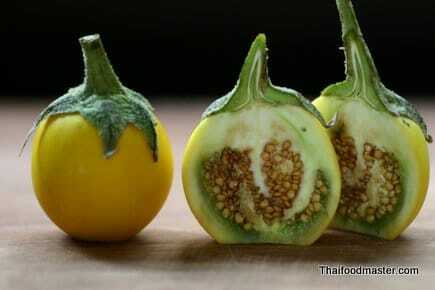 Thai people know how to bring the best out of their ingredients, even from those that in first glance seem helpless. Luckily, it is awful only in its greenish interior. Remove the seeds, soak it in water for 20 minutes and a star is born. 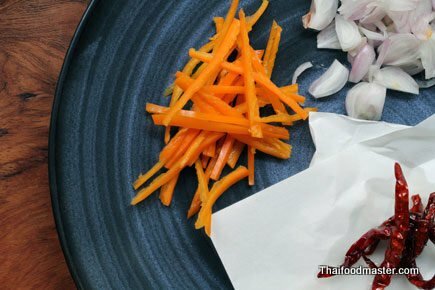 I know it is easy to reach to the supermarket shelves and grab a pack of Thai curry paste. I hope that you will consider making your own and I think you should. Things often get lost in translation, and even worse if they are commercially pre-packed for five years of use. 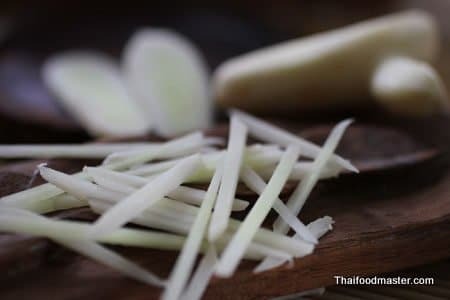 Thai cooking is based on freshness and if you are serious about Thai cooking, you will be amazed how with just a bit of an effort your food rises into new levels. White turmeric is the underground stem (rhizome) of the tropical plant Curcuma zedoaria in the ginger family. About 80 species of Curcuma have been identified, including the better-known culinary member of the family, the turmeric, with its deep yellow pigment. Quite rare in the west, white turmeric is used in Thai, Indonesian and Indian cuisines. It possess quite a long list of herbal remedies; maybe because its high levels of antioxidants. 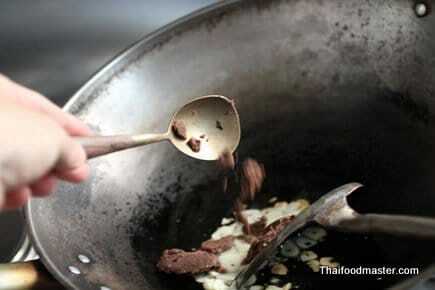 In the Thai language, lon (lohn; หลน) means to simmer. 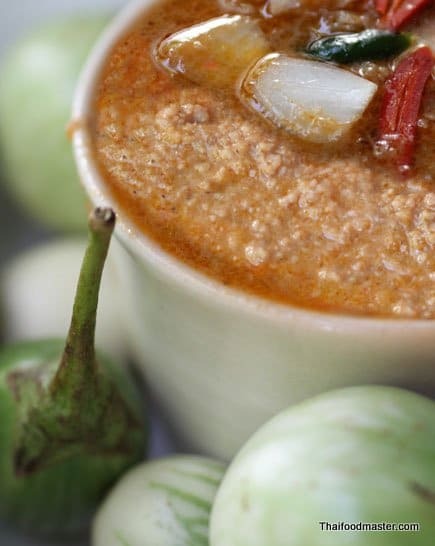 In this ancient style dip, minced pork and fermented shrimp paste, along with smoked-charred dry fish, chilies and other aromatics, are slowly simmered in rich coconut cream to create a deep, multi-layered – yet subtle and silky – dip; a dip which is then lightly seasoned with just palm sugar and fish sauce. The dip is served with an array of fresh and fried vegetables, tempura-like cakes, crispy small fishes or tiny transparent salt-water shrimp. For a dish with so many subtle flavors, there is surprisingly little fuss. yes, K.Suthathip a squeeze of lime is absolutely delicious !! This looks gorgeous!!! I love this, sadly I haven’t had it for a while because this is not available in Thai restaurants in North America. 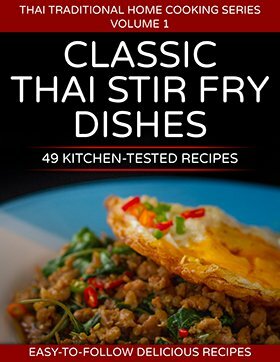 When I was in the Philippines, I used to order this every time I go to a Thai restaurant. 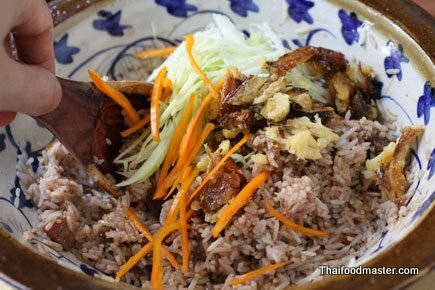 This may come as a surprise but next to red and green curries, this is perhaps the most popular Thai dish in the Philippines. 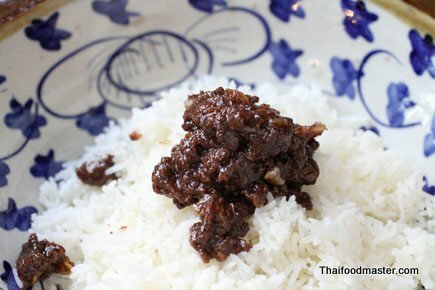 what is the good brand of shrimp paste you recommend? what is the brand you using in the picture? 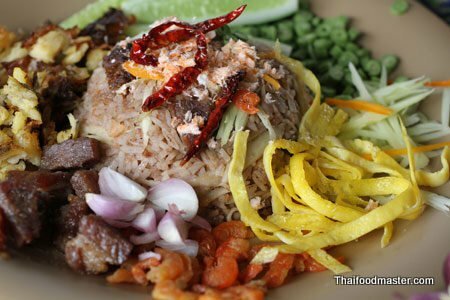 personally i prefer artisan made shrimp paste which i usually purchase in local fresh markets, if you are not located in thailand. i have no idea where are you from and what is available there.